the misinterpretation of the plan occurred on this occasion. The maze is backed by a clump of pines, planted by Lord Botetourt in 1770.
in an open field and that of the winding passages no trace now survives. Only the low bank and ditch surrounding the maze remain visible. Or nimbly run the windings of the Maze." [paragraph continues] This is from Thomas Randolph's (or Randall's) "Eglogue on the Palilia and Noble Assemblies revived on Cotswold Hills by Mr. Robert Dover," one of a collection of eulogies—the Annalia Dubrensia—by various poets of the day of the then famous annual sports organised by Captain Dover on the hills near Chipping Campden. 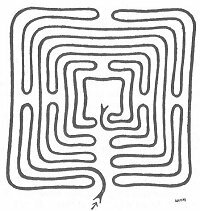 Mazes, or "laborinths," are referred to in the contributions of several of the other poets concerned, of whom we may mention Francis Izod, Nicholas Wallington, William Bellas and William Denny. A figure in the crude frontispiece conveys a similar allusion. In Essex we have an example of rather larger dimensions than the majority, namely, that on the east side of the common at Saffron Walden (Fig. 64). A tall bank hides it from the Thaxted road, which runs within a few yards of it. The four bastions (or "bellows") and the centre are slightly raised. The overall dimensions are approximately 91 ft., excluding the bastions, and 138 ft. from corner to corner. This maze is referred to in the Corporation account books for the year 1699, when it was apparently re-cut. the last occasion it was underlaid with bricks, to facilitate future renovations. 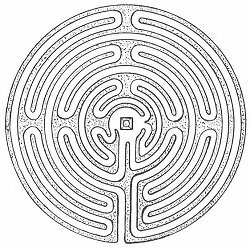 As in the case of the Winchester example, the "path" consists of the narrow and shallow groove instead of the raised turf, and this gives some weight to the tradition that it is only a copy of a much larger maze which formerly existed further to the east. In a manuscript book of the latter part of the eighteenth century the maze is spoken of as a favourite resort for the young bloods of the town, a complicated system of rules and wagers (in gallons of beer) being laid down in connection with walking the maze. It is stated that a large ash tree at one time occupied the centre, but that it perished by fire in the Guy Fawkes celebrations of November s, 1823. A few years ago some boys, playing on the central mound, discovered a Roman coin. This does not, of course, prove that the work is of Roman origin. In the 1789 edition of Camden's "Britannia" a drawing of the maze exhibits merely a series of concentric circles with extensions on the outermost pair forming the "bastions." This illustration could hardly have been prepared on the spot. About twenty miles to the north-west of Saffron Walden and a few miles to the west of Cambridge lies the little village of Comberton (Cambs). The play-ground of the village school occupies one corner at the cross-roads, and in the south-west angle of this, enclosed by iron railings, lies a turf maze of a pattern similar to that at Alkborough. Owing to the use which the school children make of it the paths are nearly denuded of grass, but the ridges are well defined, as shown by the photograph (Fig. 65), which was taken in March 1921. The present maze is a faithful copy of that which was formerly situated a few yards away, and which, when the school was built, occupied an inconvenient position just outside the scholars' entrance. The old maze was known as the "Mazles." It used to be the custom in the village to have a feast once every three years, and at such times the maze was re-cut. Comberton, by the way, is almost the next village to Bourn, where, as we have seen, a peculiar pavement maze occupies the floor of the church tower. a splendidly preserved maze, of curious plan, in a corner of the green in the rambling and out-of-the-way but charming village of Hilton (Fig. 66). to their flat and grassy nature, and the difficulty is accentuated in the case of Hilton by reason of the fact that the maze is at some little distance from the road, and is, moreover, sunk to a depth of several inches below the general level of the surrounding turf. It may easily be located, however, if one remembers that the centre is marked by a square stone obelisk surmounted by a ball. 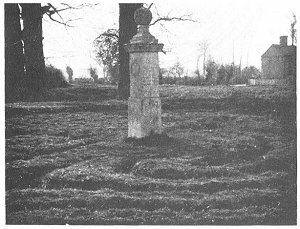 [paragraph continues] This obelisk has indications of a sun-dial on the north face, with the words "A.B. hoc." On its south face it bears a coat of arms, engraved within a circle, and the inscription: "Sic transit gloria mundi. Gulielmus Sparrow, Gen., natus ano. 1641. Aetatis sui 88 quando obiit, hos gyros formavit anno 1660." On the east face is engraved, "William Sparrow departed this life the 25th August, Anno Domini 1729, aged 88 years." The west face bears only the words "Dep. hoc." Our photograph (Fig. 67) shows the obelisk and as much of the maze as could conveniently be included with the camera used. It will be noticed that the trenches between the paths are fairly wide and deeply cut. The good state of preservation is no doubt greatly due to the fact, remarked by a writer of half a century ago, that the paths are made up with pebbles. No sign of the latter is now evident amongst the thick turf. 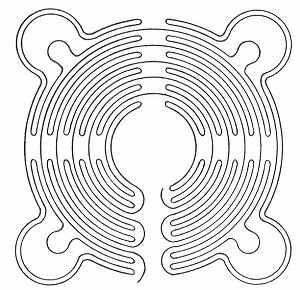 The plan of the maze shows some interesting variations on the older and more conventional designs of Alkborough, Comberton, etc., the most remarkable point being that the path from the exterior to the centre is almost direct, the labyrinth proper being composed of paths which commence and terminate at the central plot. The Hilton maze appears to be unique in this respect. Whatever may have been the original purpose of turf labyrinths in this country as a whole, it is fairly clear that the Hilton example at any rate was not made for ecclesiastical purposes if, as stated on the obelisk, it was constructed in 1660. On the other hand, the reflection that at that date Puritan influences were on the decline and the restoration of the Monarchy was imminent leads one to conclude that this somewhat exuberant design of a youth of nineteen was intended for purposes of rustic enjoyment. 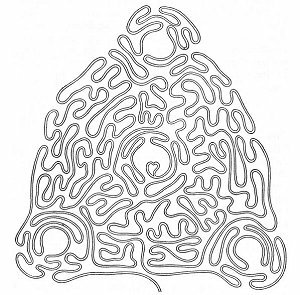 of the mazes mentioned were apparently of similar design. A friend of the writer was unable to find any traces of a maze in the locality in 1920. On the summit of a hill by St. Anne's Well, Sneinton, Nottingham, there formerly existed a maze called "Robin Hood's Race," or "Shepherd's Race." It was of a design somewhat similar to that at Saffron Walden, but having each of the four bastions ornamented with an incised figure of the type known in heraldry as a "Cross, crosslet, fitchy." The path was stated to be 535 yards in total length. 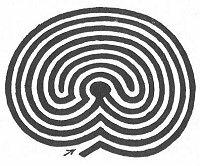 When the lordship of Sneinton was en-closed, in February 1797, the maze was ploughed up. An enterprising printer of Nottingham, J. Wigsby by name, preserved for us the plan by publishing in the following month an illustrated pamphlet in commemoration of the maze, "Sixpence plain, eightpence coloured." Another turf maze used to exist in the same neighbourhood, namely, at Clifton, about four miles or so from Sneinton, on the opposite side of Nottingham. This was of a square design similar to that of the garden maze shown in Fig. 75. At Somerton, near Banbury, Oxfordshire, there has been well preserved a very good "Troy-town" (Fig. 69), of a plan which recalls that on the tiles of Toussaints Abbey. It is situated in the garden of a farm-house, named after it "Troy," and is surrounded by beautiful trees and shrubs. Our drawing is made from a sketch kindly supplied by the brother of the present occupier, Mr. J. F. Godwin. Its dimensions are 57 ft. by 50 ft., and the turf path, one foot in width, has a total length of 400 yards. rather excessive unless we allow for a considerable margin between the bank and the maze itself. Another Oxfordshire locality, Tadmarton Heath, is mentioned as a turf-maze site in a manuscript by the Rev. T. Leman, quoted in a county history published in 1861, but if such a work ever existed there all traces of it have now disappeared; the same is true with regard to another reputed maze site to which reference is made in the manuscript, namely, the Herefordshire Beacon, in the Malvern Hills. In both cases the situations are such as might well have been selected for the purpose, judging by analogy with other known turf-maze sites. Sixty years is none too long a period to allow of the complete obliteration of the turf figures, if such existed, in the absence of care and attention, so that it is not surprising if we now find ourselves unable to trace them, especially if they possessed no circumscribing bank or ditch. In Surrey a "Troy-town" was formerly well known in the neighbourhood of Guildford. It was cut in the turf on Hillbury, between Guildford and Farnham. 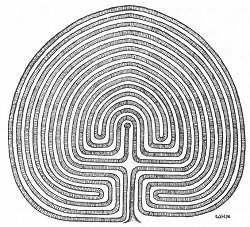 It may be that the earth-rings of which traces are yet visible on St. Martha's Hill, on the other side of Guildford, constitute the remains of a similar work. It is said that the youths and maidens of the town used to congregate here on Good Friday and indulge in boisterous celebrations, the origin of which is not known. Another Surrey spot formerly alluded to as having a turf maze is Putney Heath. Unfortunately, however, we cannot at present point to any authentic traces of a single specimen in the whole of the county. [paragraph continues] Julii Laberius), who was killed by the Britons. The latter theory was, however, maintained by a writer to The Times as recently as April 5, 1920. 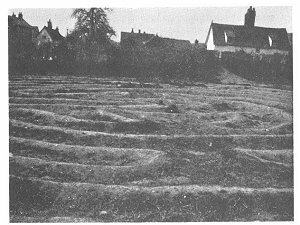 The fact that as late as 1893, according to a letter to Notes and Queries of that year, traces of a "bower" or "Troy-town" were still observable in the neighbourhood of Walmer, shows that the Chilham work, if a turf maze, would not have been unique in the county. It is also said that one formerly existed near Westerham; the name "Troy-town," moreover, survives in other parts of the county (see p. 211). Additional support for the theory of a turf maze site at Chilham is found in the occurrence of the name Bowerland, applied to a district to the north of the village. We find, too, a hamlet of Bower, only a few miles to the south-west. In Bedfordshire, not far from Dunstable, there is a circular earthwork on the downs called "Maiden Bower." Stukeley refers to it in his discussion on Julian's Bowers as being in his opinion the site of a former turf maze, and there is some force in this contention. He mentions in the same reference a similar work at Ashwell. Dr. Trollope stated that specimens had been reported also from the county of Devonshire and in Scotland, but actual details are not at the moment available. There is no doubt that the custom of cutting these devices in the turf was formerly very widespread throughout the land, although comparatively few examples now exist. 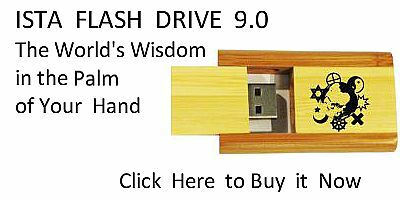 Even during the past generation, as we have seen, some are known to have disappeared. Let us therefore hope that all possible care will be taken to preserve those that remain to us.